Borneo, the third largest island in the world is home to the endangered orangutans. The only civilization checks were when occasionally, noisy speedboats carrying some locals, sped past my klotok. What’s your obsession with monkeys?” my friend quipped on hearing about my travel plans to Borneo to see orangutans. “They are not monkeys, but apes,” I corrected her and informed her about my wish to see the gentle apes in their natural habitat ever since I saw some images of them in a magazine. Cut to two months later and my wish had been put into action. It started on a rather busy traffic filled morning, when a friend and I left Jakarta to fly to Borneo for my encounters with the orangutans which also entailed cruising through the thick rainforest of Tanjung Puting National Park. As we arrived into Pangkalan Bun Airport, our charming and smiling guide Husni, cheekily wearing a black t-shirt with the face of an orangutan, greeted us. “Orangutans means person of the forest”, he said as he settled us into our modest klotok (traditional wooden houseboat). We were sailing on the Sekonyer River and traversing through a narrow jungle river to reach the national park. The closer we were to the national park, the further it was from civilization and cut off from the rest of the world. The only civilization checks were when occasionally, noisy speedboats carrying some locals, sped past my klotok. Covering 4,150 km of tropical rainforest, Tanjung Puting National Park is an important conservation center for wild orangutans in Borneo. Husni informed me that it is home to over 5000 orangutans but the population is declining every year due to the increase in palm oil plantations. The trees in the forest are axed to make way for the plantations which affects the population of orangutans as their natural homes begins to shrink in size. During my three-day cruise, I visited three feeding stations for orangutans and spent about two hours at each feeding station. 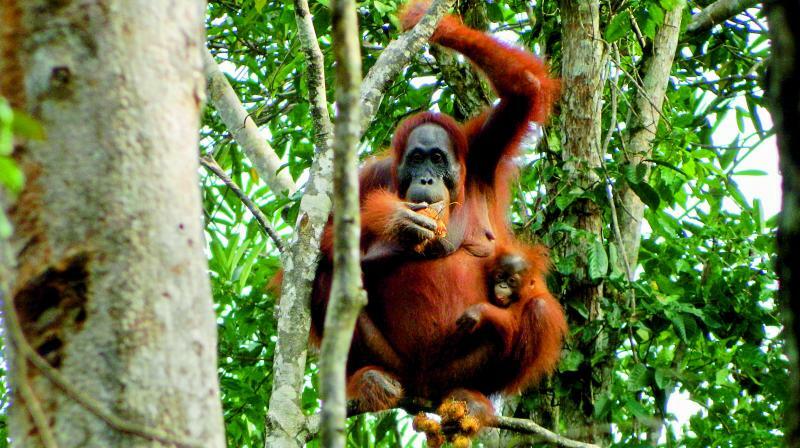 After an hour-long jungle trek to the feeding station, we spotted a mother with a baby orangutan. The baby clung on the right hip of the mother while she stretched across trees with her astonishing long arms. The mother and baby were quite oblivious to our presence as we took on the role of eager paparazzi clicking their every move. The mother was busy eating her fruits and soon a male orangutan also joined the feast to complete a perfect family portrait. A few more joined the group and now we were witnessing a gang of orangutans. At Camp Leakey, which is a famous conservation camp of the national park, we also got sighting of gibbon monkey and a herd of wild boars. When we were not spotting orangutans, we spent the day cruising along the jungle river, enjoying the cool breeze and lush plantations from the upper deck of the boat. While sailing, we got to spot some rare long nosed proboscis monkey, hornbills and kingfishers. By nightfall, the crew on my boat pulled down mosquito nets around the mattress to form a veiled bedroom. After wonderful traditional Indonesian dinners, I would gaze at the starlit sky and sleep peacefully to the symphony of jungle sounds. At the end of the third day while we were sailing to return, it rained heavily causing a delay. I must have secretly prayed for the rains to continue in order to prolong this wonderful safari. The jungle sounds are always more soothing than the pings on my mobile phone. How to Reach Tanjung Putting National Park: Access is via Pangkalan Bun, which has the nearest airport, or the port of Kumai, followed by a 2½ hours boat trip to Tanjung Harapan. From there, it is a further two hours along the Sekonyer River to reach the park. The area is known to be a malaria zone so you are advised to take preventive anti-malarial medication.